Are you counting down to San Diego? Please celebrate the efforts to shape and promote policies that promote health by nominating individuals or groups who have significantly contributed to creating and/or implementing policies or policy-based changes that support and positively impact the food and physical activity environment. Nominations accepted through Friday, May 20. Download the nomination form. The SNEB Advisory Committee on Public Policy is looking for additional committee members! Responsibilities of the two-year term include participation in monthly conference calls, updates on relevant policy issues and weighing in — through public comments, sign-on letters and other channels — around SNEB priority issues. ACPP members also help plan SNEB's annual conference ACPP plenary session. If interested, please complete the nomination form and submit by Monday, May 16. Pre-recorded/archived webinars are a way to learn new information and sometimes obtain free continuing education credits. The webinars/recordings listed below are available to anyone, not included here are those available only to members of professional associations. Persons with low resources, such as housing, money, healthcare and basic daily needs, may be aware of assistance in their area but are not matched to those services. Nutrition educators are located throughout most communities ready to teach. Challenges occur between communicating what type of services are available to the specific group and finding a match to those best able to teach. This session will discuss what challenges educators face in their specific locations, and provide opportunity for those persons on the webinar to share ideas with each other. Educators will be engaged in learning new ideas to program more effective with those in need. The SNEB Public Health Nutrition Division will be sponsoring this event. Thank you Alex for reporting on discussion you attended as a representative of SNEB. Agree on the need for a unifying message to support research to improve food, nutrition and health. Better understand the research funding priorities of those around the table and explore common elements that would inform the development of a unifying message aimed at federal policy-makers. Opportunity for questions and dialogue on the value of a unifying message for increasing public research funding of food, nutrition and health and on the potential opportunities and challenges that lie ahead. Representatives from the academic, government, private and public sectors were invited to attend. Additional RMF plans for 2016 underway or in development include: the AAAS Riley Memorial Lecture on May 23; endorsements from other key leaders and stakeholder organizations (in addition to the Delta Council and a few farm/commodity organizations), and plans for a final, integrated report on the unifying message, tentatively aimed for release in January 2017. 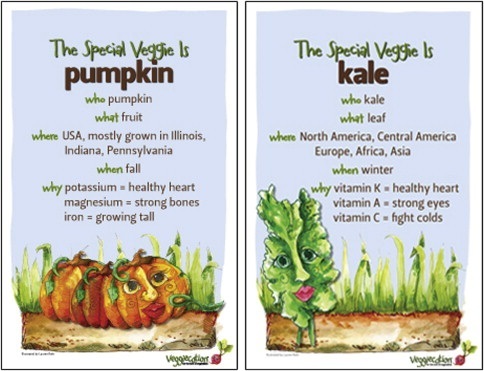 Veggiecation posters feature Veggie of the Month (ie, broccoli, cauliflower, parsnip, pumpkin, butternut squash, kale, snap peas, zucchini and asparagus). Interview: Karen W. Cullen, DrPH, RD, reports how playing a serious online video game designed to both entertain and promote behavior change helped a group of 400 fourth and fifth graders set nutrition goals, which resulted in improved fruit and vegetable consumption. Food hubs, which are a businesses or organizations that manage the aggregation, distribution and marketing of locally-produced food, play a key role in creating opportunities for small and mid-sized producers while also satisfying growing consumer demand for local products. The new report, Running a Food Hub: Assessing Financial Viability, provides modules and best practices for food hubs to maximize profits and control costs. The U.S. Food and Drug Administration has announced the publication of its final guidance for industry, "A Labeling Guide for Restaurants and Retail Establishments Selling Away-From-Home Foods — Part II (Menu Labeling Requirements in Accordance with 21 CFR 101.11)." University of Edinburgh via EuerkAlert! After over a year of user research (thank you! ), designing, testing and creating, we are excited to invite you to explore the new securenutrition.org. A colorful "Why Nutrition" video making the case for multisectoral action. A "How To" Guide to multisectoral nutrition — a "living document" aimed at providing practical guidance to technical practitioners designing or implementing nutrition-sensitive interventions. We'll be coming to you for more feedback on this soon! A robust digital library now covering all sectors contributing to nutrition outcomes, and featuring improved filtering and browsing options. An event calendar, now with direct downloads to iCal, google calendar, outlook, etc. Also, please submit your event!